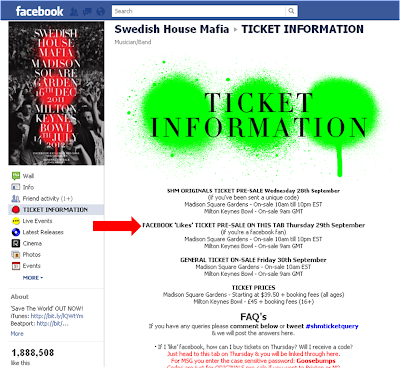 Tickets for the Swedish House Mafia event at Madison Square Garden in November and the Milton Keynes Bowl (UK) in July 2012 go on general sale on Friday 30th September 2011, however, the Swedish House Mafia have pre-sale tickets for sale from a tab on their Facebook Page on Thursday 29th September 2011 - but only to people who have Liked the Page. This rewards fans, but also gives an incentive to more people to Like the Page (and receive future Page updates as a result.) A nice example of Owned Media on Facebook being used for commerce as well as advocacy. Digital marketing does not believe that most commonly used tactic to cheap Facebook fans. Mind boggling experience , timing was perfect and high energy performance by Katy.Special effects and well organised. Worth every cent. PS : I never knew it was an indoor auditorium and would hv loved to carry a hoddie or something warm. It was a bit too cold in the beginning b4 the show.